You know you are a mom when…household appliances get you overly excited! 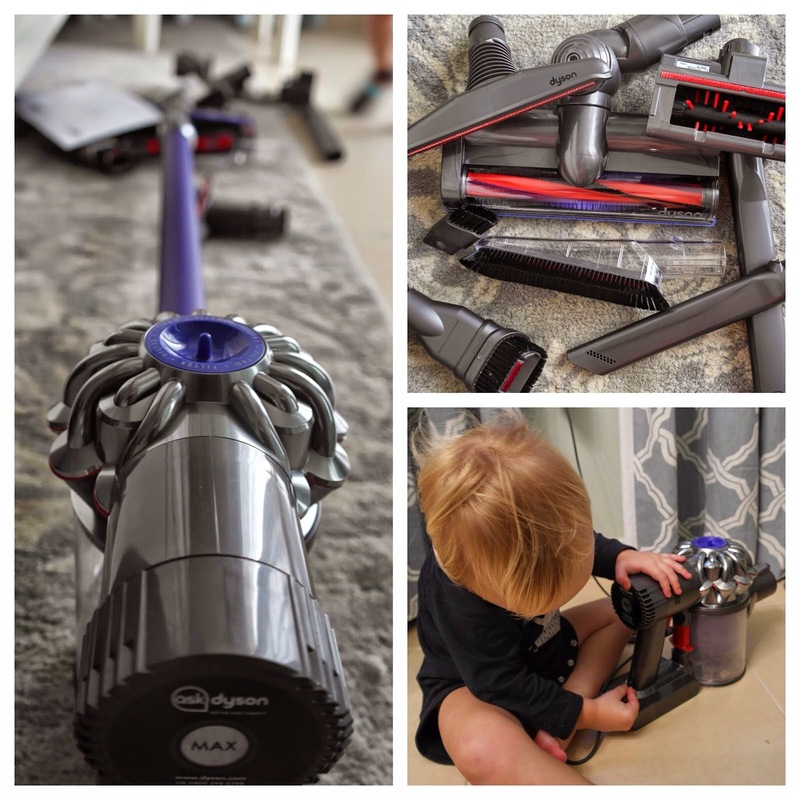 Ever since I have had children, friends and family always rave about what a great investment a Dyson can be. It is a bit more pricey than your average vacuum cleaner, yes. Plus I was always weary as I have had to replace 3 vacuum cleaners (Karcher, Bissell and Hoover) in a mere 5 years! So when Dyson approached me with reviewing one of their new products I couldn’t help but jump on the idea. I was ecstatic! A dream come true for this crazy cleaning stay at home supermom (I like to think I am)! The package arrived, so slim and sleek. 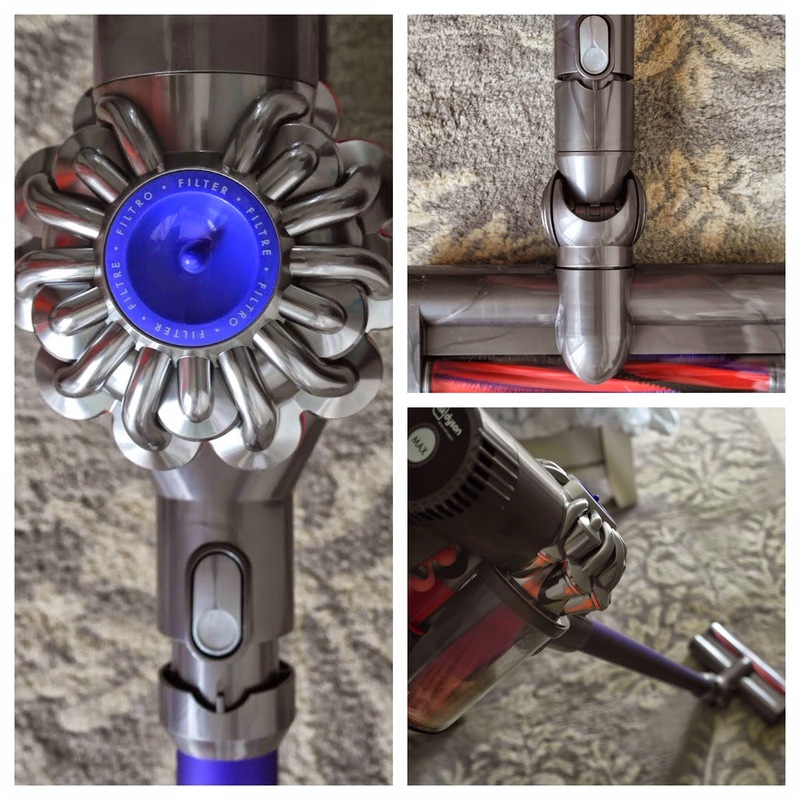 I am going to go out on a limb and just put it out there…I think Dyson’s are the bombshell of vacuums! Silver, purple, thin and powerful! The Victoria Secret Angels of vacuums to make it clear! Some of you may, or may not know…but I am really OCD when it comes to cleaning my house. I must admit the past few months I have been way more chilled out about it than my usual self. HOWEVER, the odd time I do get cleaners to come in I find myself getting more irritated because I know I can do a better job than them. Following this, I beat myself up on why I just wasted that money on cleaners when I could have done the job myself. I could have used that money for a way better investment. I blame this on my mom:) I need to make sure the edges of the mouldings that go around the perimeter of the floors are dust free, the tops of picture frames (especially the ones hanging on walls), wooden shutters…I could go on and on. My Mom taught me this! My biggest pet peeve is when lightweight furniture is not moved and vacuumed underneath. So with all that said, I am giving you a full 100% honest review since I actually am the “cleaning lady” of my house. Oh, and my assistant Nate…who…for some odd reason loves cleaning. I can’t complain about that, he is a darn good helper for not even being 2 years old! Coincidentally Nate’s favourite thing of all is vacuuming! It was one of his first words! I kid you not! We always have a power struggle over who gets to vacuum. Of course I only let him do small areas and then I take over since he can never push the beast of machines we have had. And being the perfectionist that I am, I go over all the areas my little fella did. I know, I am cruel! But I like a job well done. One thing that drives me bonkers is that I can never vacuum my staircase properly. The cord does not reach far enough, even with a power extender. Plus I get all freaky knowing Nate is around and he could hurt himself tripping over cords. I end up having to sweep them one by one (there are 18 in total +2 landing areas). What a pain in the you know what! And I can never quite get all the dust and sand in the crevices. Especially with the latest sandstorms we have been having…ugh! Another thing…the power cord never can reach the bathrooms and that makes me feel like my bathroom floors are not 100% sanitized (there is the OCD in me coming out). There is nothing like passing a vacuum cleaner on the floors, it gives you that satisfaction that every single little speck of dirt has been removed from you floors. Trust me, I was never like this until I had kids. I get all creeped out just thinking of my children being on a dirty floor. Okay, deep breath…here goes my spiel on this beautiful masterpiece! I need to contain myself before I get too hyperactive! 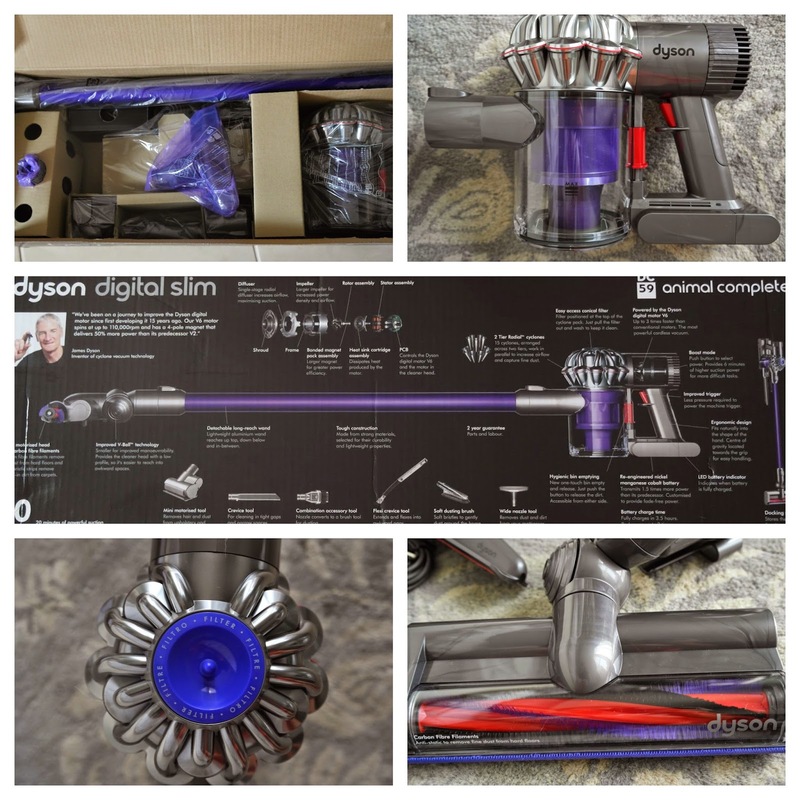 This Dyson Digital Slim does NOT have a cord! Yes it’s CORDLESS! Hallelujah! It suctions 3 times harder than any other cordless vacuum cleaner on the market. It is engineered to capture fine dust (perfect for this sandpit we live in). It is so lightweight and easy to maneuver; both the kids and I can use it with ease. I can even carry Nate on my hip and vacuum at the same time! Something I could never do with our other machines! It has a V6 motor, which means POWER! It has a special “boost mode” which you can press that gives you 6 minutes of higher suction power for those really dirty spaces. The trigger to activate it is SO easy. Check out the videos of Nate who is not even two using it! Now for the cleaning bit! The filter is located right at the top, all you have to do is pull the filter out and wash it by hand to keep it clean. Easy peasy! And to empty the bin (which shamefully filled up REALLY fast in my home) is a one-touch release. You push the button (make sure you are near a garbage bin) and all the dirt releases! Nate did this a few times, and he was so excited he told me “Mommy, look candy”! Hahaha he thought it looked like GREY cotton candy…oh boy! Another fun fact, is that the motorised head you see Nate using in one of the clips, has carbon fibre filaments that can remove fine dust from hard floors and nylon bristle strips to remove ground-in dirt from carpets. SO perfect for our house! We get so much sand all year round! You get a full 20 minutes of powerful suction when the battery is fully charged. If you use the motorized floor tool you get 17 minutes. Just enough to get either my upstairs or downstairs done and a speedy workout (I don’t go to the gym, cleaning is what I consider my fitness). I then pop it on the charger, wash the floors/dust and move on to the next level of the house. To sum this up, I am SO pleased with this cordless Dyson! I can get into all the small and strange places (like behind our bed in our master bedroom that weighs a ton and can’t be moved). It is great on my stairs and I can even take it into the bathrooms without fighting a cord and getting all irritated and worked up! My only wish is that the dust bin was bigger. We have these fuzzy wool carpets that get so piled up. They used to shed so much when we first got them, worse than a dog and cat combined! They are under control now with frequent vacuuming, but they do sometimes pull up a lot of “fuzz”. Of course a longer battery time would be amazing too, but since it is cordless I am not complaining! When I am finished using it after a clean, it gets mounted on a clever docking station. To fully charge it, it takes 3.5 hours (which by the way is 3 times faster than other cordless machines). However from my experience, it charged much faster than 3.5 hours. It’s that easy to charge! Oh and one more thing! It is so light, I do not mind bringing it upstairs and downstairs on a daily basis (my kids create a lot of mess EVERY day). This machine keeps my patience under control. So from one mother who has enough on her plate looking after two small children & maintaining a clean house, I want to thank you James Dyson for making this perfect machine. You have saved my sanity and made housework “that much easier”. Dyson machines can be purchased all over the MENA region. From my experience, ACE Hardware has a good selection. You can go there and even try them out yourself using the floor samples. You also get a 2 year guarantee (standard for everywhere in the world) on parts and labour. « A Very Bad No Good Day!